HOUSTON  (July 15, 2008)  Despite a tenth consecutive monthly decline in sales, the average and median prices of a single-family home in the greater Houston area soared to record highs in June, according to statistics released by the Houston Association of REALTORS® (HAR). Single-family home sales slid 14.7 percent on a year over year basis. However, the number of closed sales was the highest since last August. The average price of a single-family home rose by 4.5 percent last month to $228,448, surpassing the previous high of $218,583 in June 2007. The median price of a single-family home rose 1.3 percent last month to $162,000, surpassing its previous high of $160,000, also from last June. Sales of all property types for June 2008 totaled 7,237, reflecting a 15.1 percent drop compared to June 2007. Total dollar volume for properties sold during the month was recorded at $1.6 billion versus $1.8 billion one year earlier, a 10.7 percent decline. All listing categories combined, Houstons overall housing market saw a continuation of mixed results in June. While both average and median single-family home sales price rose on a year-over-year basis, total property sales and total dollar volume tumbled. The number of available homes, or active listings, at the end of June was 53,792 properties, a 2.0 percent increase over June 2007. The figure was up 487 properties from May 2008. Month-end pending sales  those listings expected to close within the next 30 days  totaled 4,456, which was 20.6 percent lower than last year and strongly suggests the likelihood of another sales decline next month. The months inventory of single-family homes for June came in at 6.7 months, a slight increase from Mays 6.6-month figure. This compares to the June 2007 single-family homes inventory of 6.2 months. The average sales price for single-family homes reached a new high of $228,448 in June, up 4.5 percent from the same period last year when it was $218,583. Thats the biggest pricing increase since February 2008. The overall median price of single-family homes in June was $162,000 compared to the national single-family median price of $206,700 reported by the National Association of REALTORS®. These data continue to illustrate the higher value and lower cost of living that prevail in the Houston market. Additionally, total June sales of single-family homes in Houston came in at 6,113, which was 14.7 percent lower than June 2007. Positive year-over-year sales activity continued in Houstons low-end single-family home market, with a 29.3 percent increase among homes priced below $80,000. HAR also reports existing home statistics for the single-family home segment of the real estate market. In June 2008, existing single-family home sales totaled 5,252, which was a 12.6 percent decrease from June 2007. At $211,653, the average sales price for existing homes in the Houston area rose 3.1 percent compared to the same period last year. The median sales price of $154,900 for the month increased 1.9 percent on a year-over-year basis. The Days on Market (DOM) statistic for June dropped to 76 from 79 a month earlier, slightly exceeding the 72 days registered in June 2007. The DOM is at its lowest level since last September. At $179,331, the average price of a townhouse/condominium in the greater Houston area reached a record high in June, increasing 11.9 percent from one year earlier. 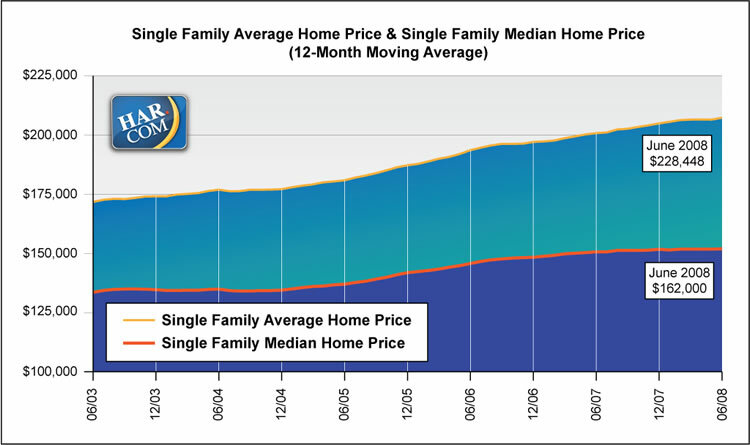 The median price rose 5.4 percent to $136,750 from June 2007 to 2008. The number of townhouses and condominiums sold in June reached the highest level since August 2007, but was down from one year earlier. In the greater Houston area, 638 units were sold last month versus 708 properties in June 2007, translating to a 9.9 percent decrease in year-over-year sales. Lowest Days on Market since September 2007.